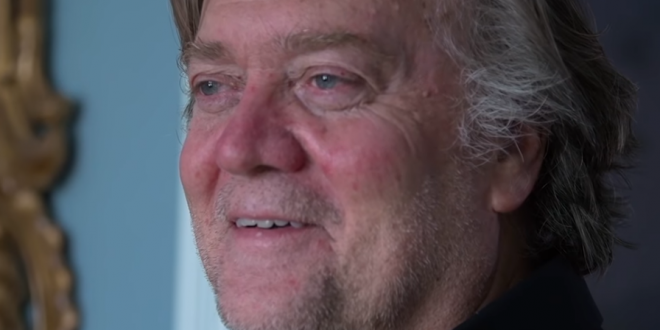 Steve Bannon Bashes Doc About Him As Trailer Debuts - Joe.My.God. Former White House chief strategist Steve Bannon, an architect of President Trump’s “nationalist” political and policy strategy, is warning about a pending movie release he says portrays him negatively. The film, “The Brink,” is coming to theaters March 29. Bannon let film crews follow him for a year, but despite his cooperation, the one-time film producer himself suggests it paints a “damaging portrait” of his efforts to spread his populist message in Europe and elsewhere. “If I had not come on as CEO of the campaign, Trump would not have won,” Bannon says in a preview of the film, referencing his time on the final months of Trump’s 2016 campaign.